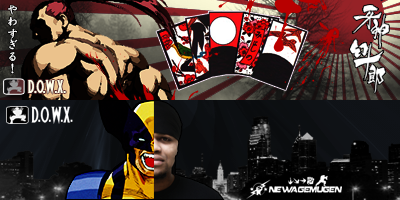 » Mugen Cinema » D.O.W.X. ON NEWAGE! Those were awesome! That commercial cracked me up. And that Super Web Slam finish...magnificent! Lookin' fresh as ever, DOWX! Good to see you back D.O.W.X! lol you've been gone for a while buddy. Welcome back DOWX, even though I don't know you. @Leo116 wrote: Welcome back DOWX, even though I don't know you. Good to see you around still, bro! Do what you gotta do, we hope to see you back around as well! Good luck with school. 76 Re: D.O.W.X. ON NEWAGE!